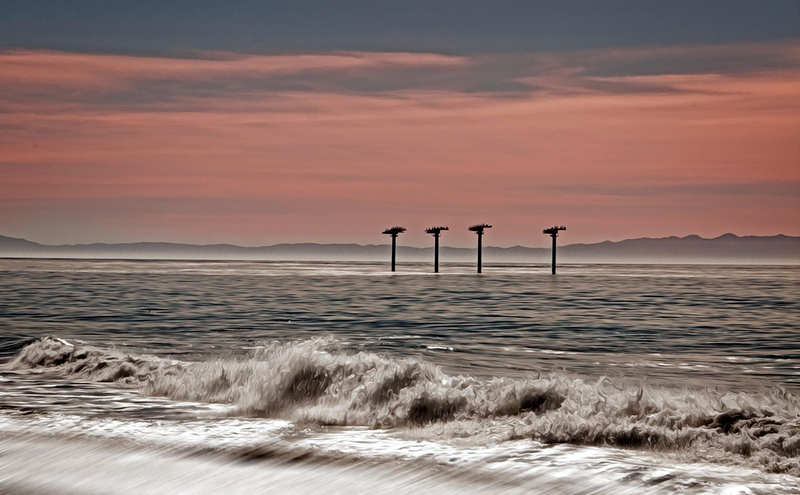 Just off the coast from Sandpiper golf course, these four structures sit quietly. Several times a day people look at them and ask each other, what are those? And usually the answer is a random guess. Here’s the story. In the early 1930s, Ellwood was a booming oil field. It all started where Sandpiper is today in a well named “Luton-Bell No. 1“. Shortly after they struck oil there, wells sprung up all round the area and the coast got pretty ugly. Eventually some of the well’s production slowed down and they were capped. 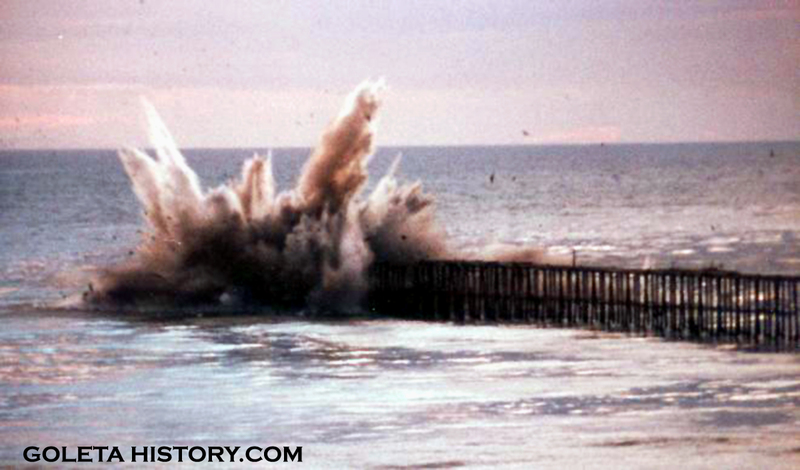 Starting in the 1950s, some wells were permanently plugged and abandoned and portions of the piers were removed. Unfortunately, they did a really bad job of removing them, leaving pilings and pipes exposed in shallow water and portions of piers left freestanding. In the background of the 1970 photo above, you can see two remaining well towers in the center and the old Bird Island to the far right. The remaining offshore structure became a part of the scenery as well as a local fishing destination. It was substantially damaged during a storm in 1980 and the experts predicted that the remainder of the structure would soon be knocked down by another storm, or an earthquake, or it would just collapse on its own. California. By this time Brown Pelicans were a constant presence on the structure, and several varieties of gulls could be seen there as well. As concerns grew about the hazards presented by the pier and the liability to the owner, the decision was made to take it down. But during an environmental review in 2002, the California Fish and Game Department raised concerns about the loss of habitat for birds. Plans were made to replace the old structure with something that would accommodate their continued nesting and roosting, and a new structure was designed. 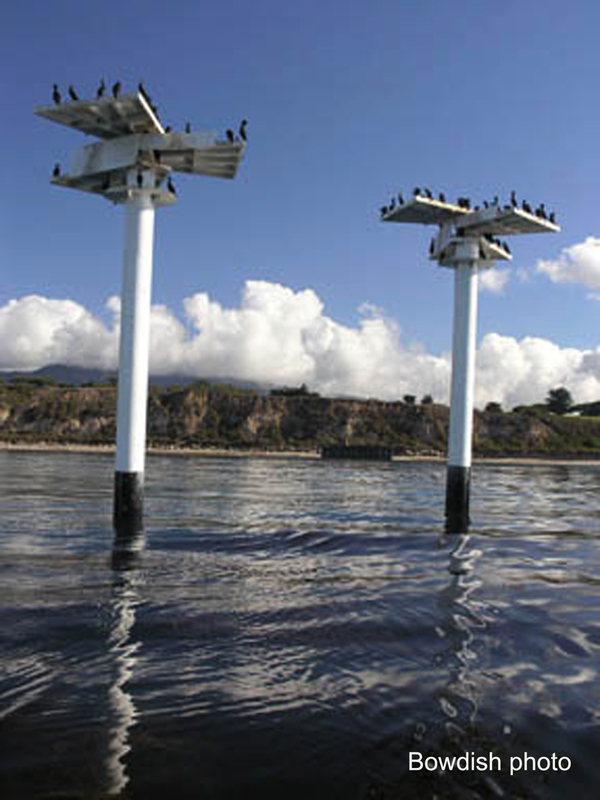 The Audubon Society was put in charge of monitoring to see if the seabirds would use the new structure. For five years after the structures were erected, Santa Barbara Audubon Society, with funds provided by British Petroleum, would watch for the return of the birds to the new Bird Island. The above photo shows the old structure before it’s removal, and the new structure can be seen on the deck of the barge. The construction of the new Bird Island was completed in December 2005. While a few cormorants were attracted to the structures right away, it was never certain whether birds would really take to them the way they had to the old Bird Island. By the end of the first month, as many as 79 cormorants had been counted on the structures at one time. This was well below the 200-plus that were sometimes on the old structure, but it was encouraging nonetheless. After several years, the new structure has been a hit with the cormorants, bringing in more than ever. The pelicans, gulls and other species have been using it a little less than the old one. The new structures received a little media attention, but their purpose was soon forgotten by the general public. Overall, the bird project could be called a success. To the old timers, the new structure is a monument of sorts, a tribute to the old hunk of oil pier that sat quietly there for years. Information provided by the Santa Barbara Audubon Society. Some photos by Callie Bowdish, John Wiley, Patti Gutshall and Bobby Morris. 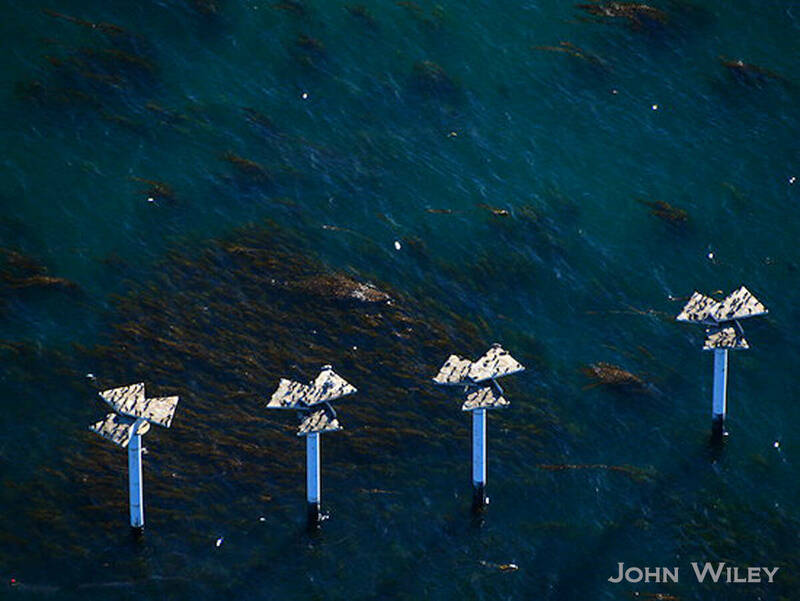 I think one of the primary reason the original bird island was taken down was because many people did not want to let the oil company get away with leaving a reminder of the pier standing. I actually think the old pier looks way better than the sterile new bird island. Finally, the fact that a common bird, the cormorant, inhabits the new bird island and the more rare brown pelican does not, shows we have a lot to learn. It does make one wonder what the difference was which caused the pelicans and gulls to stop using this roost. I have only ever seen cormorants out on the new Bird Island. That said, I appreciate that we humans did something right for once, and helped keep a safe and viable place for birds. Thank you to all who took part and made this happen. very cool history, thanks so much for this website. It’s answering so many of my questions I’ve had growing up!